SmartSERP finds the keywords your website is ranking for! Keep track of all the keyword rankings for your website in a single place. Our Project Overview gives you an insight to all the project’s status. Rankings are updated daily and you will never miss any important updates in keyword ranking with our notification system. Save numerous hours spent on checking and analysing ranking positions for your website for all the keywords. See all the keyword rankings for your website at one place. What is Auto Keyword Discovery technology? A rank tracker which automatically finds & suggests to add the keywords which the website is already ranking! Our unique method unlocks most of the keywords your website is already ranking for in Google. So you won't have to manually add it to the list. You can choose to add those keywords which matters most to you. You can manage all the keyword suggestions if you want to attend to it later. More over you can also remove the domains that is being auto discovered as simple as that! I have been using SmartSERP for all my company's SEO rank tracking needs and couldn’t be happier with their service and expertise. One of the things I love most about SmartSERP is that it keeps finding new keywords everytime i login. Now i can easily find potential keywords to add to our target list, with almost zero effort from my side. They’ve surpassed all of my expectations and customer service! Our unique technology unlocks most of the keywords your website already ranking in Google. so you won't have to manually find & add it. SmartSERP keeps daily record of accurate ranking data for your keywords. Analyse the keyword ranking easily with the aid of ranking graph. Stay updated on the changes in the ranking positions for keywords. Get alerts when there is a drastic drop in ranking. You won't have to think much to create project and navigate through our system. Our UI is so simple that even the beginners would find it easy to use. Know the keyword's value and search volume generated from google which helps you find potential keywords. Venture Beat, AlternativeTo, Capterra, Next Big What, Listhunt, G2Crowd, Launching Next and many others. Conventional rank tracking tools can only tell where your website is ranking from the keywords you provide. 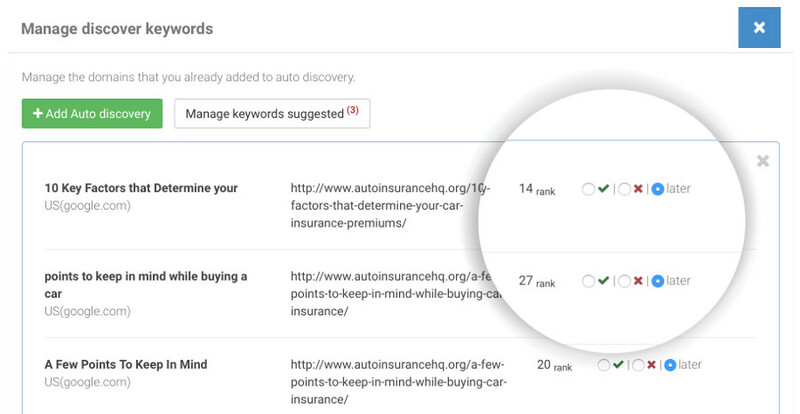 SmartSERP lets you know about keywords you didn’t even know your website was ranking for. How often are the keyword rankings updated? The keyword ranking gets updated on daily basis. You can manually refresh keywords anytime easily from the project dashboard. Can I track more than one website? 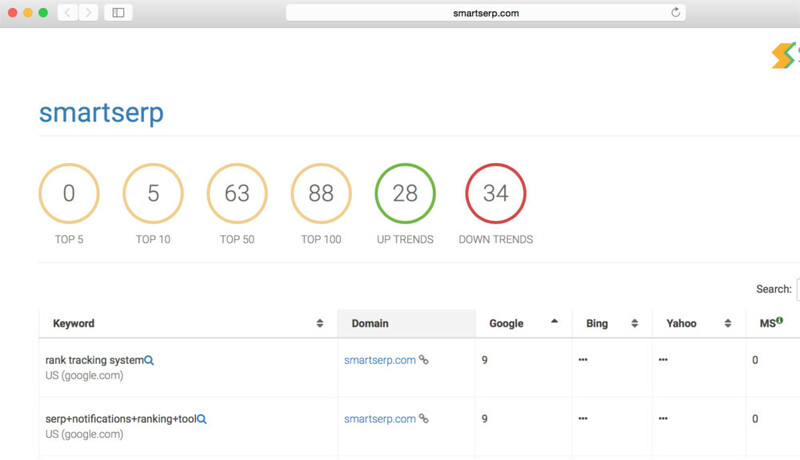 SmartSERP allows you to track as many websites as you need to, on an unlimited number of domains. It is even possible to track the website of a competitor. How long does it take to discover keywords? Auto discovery will start discovering keywords within couple of minutes and might take upto a week to discover most of the keywords for a domain or url. We accept payments from MasterCard, Visa, Visa Debit & American Express. We also accept Paypal. Start your free account now and subscribe after 14 days trial.